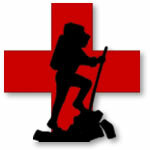 Every serious, quasi-regular hiker should have some level of first-aid knowledge. Specifically, unless you’re a guide and have your Wilderness First Responder (WFR) or Wilderness Emergency Medical Technician (WEMT) card, you should probably test for your Wilderness First Aid (WFA) card, to include Cardio-Pulmonary Resuscitation/Automatic Electronic Defibrillator (CPR/AED) training. This will empower you to better tend to yourself, others in your party, and anyone you may encounter in the mountains — specifically the backcountry, a place where an hour could pass before help arrives — that could need medical attention due to illness or injury. You could save a life! That said, you don’t have to have medical training to be helpful. If you’ve never had any training, below are a few things you can probably still do, and others you shouldn’t do, that could be helpful in your medical response to a patient in the backcountry. Do assess the situation from a distance before rushing in to help. Look for hazards to you or the patient such as rock or ice fall zones, slick ground conditions, thin ice, avalanche dangers, swarming insects, “widowmakers” (tree limbs precariously perched above the scene), or anything that looks like it could hurt you or further injure the patient. Do approach the patient if the scene is deemed safe and announce yourself as you do so. The patient may be unresponsive but might very well be able to hear you. Try to be reassuring. Don’t say stuff like “holy crap, mister/miss, you’re a goner” or gasp in alarm. These words are not at all comforting. Do observe carefully. What’s your general impression of the scene? Can you determine what happened? This info can help you decide what to do next. Illness? Injury? Do put on gloves if you even suspect there may be blood, urine, feces, or any bodily fluid, unless the patient is family. Know that blood and whatnot can pool underneath out of sight. Use care. If not prepared with nitrile gloves (don’t bother with latex), do your best to stay clear of said fluid while still trying to lend aid or stay away if you can’t. Do touch the patient, putting your hand on their forehead and tell them you’re doing this as you do it. Tell them you are here to help. Maybe you can or can’t, but the reassurance might calm them anyway. Doing this will put you in control, and also keep them from trying to sit up. It’s good to note if they are breathing at this point. Do check the patient’s responsiveness. How alert and oriented are they? Ask for their name, then ask if they know where they are and what day it is. If they know these things, ask them what happened. The more answers they provide, the better off they likely are. Rescuers will love to know this info. Do try other techniques if they aren’t seeming to respond. Are they at least voice-responsive? A moan after you speak, or any sign? If the answer is no, try to cause some pain by pinching loose skin hard or grinding a knuckle into the sternum, though don’t jostle them. If still unresponsive they may be unconscious, or worse. Quickly check their vital signs like a pulse and airway/respiration. Again, they are breathing, right? Look for deformities. Note whatever you can. Do call for help. Try your phone. Even if you don’t have cell service. There might not a be a cell tower for miles, no bars, no G, but there could be a 9-1-1 repeater piggybacked onto a USFS relay or another tower on a nearby ridge. It’s worth trying! If you do reach 9-1-1, try to speak with them out of earshot from the patient. Do send for help. No-go on the comms? Well, hopefully you’re part of a party of four so you can stay with the patient while you send two runners for help. In fact, if others are with you, some of these steps can be carried out simultaneously. Do try to further assess to see if the patient has a back, neck, or head injury or if they’ve had a high-impact, high speed trauma. The nature of the incident could be obvious. If not, be careful in handling them. Also note that distracting injuries, intoxication, and other factors may make the patient themselves unreliable if they are responsive. Look for fluid from the ears, bruising behind the ears or around the eyes, bleeding, dysfunction of any sort, or any physical sign or possible cause of head, neck, or back trauma. Consider what they were doing: slow hiking or snowshoeing versus fast mountain biking or alpine skiing. Do roll them half way over so you can get a sleeping pad under them if you have in fact been able to absolutely rule out a neck or back injury and clear the spine. This is critical, but getting them off the ground very important in itself, so if it’s possible to turn them, do it. Note that there are ways for a single person to roll a patient in the backcountry, but this technique is beyond the scope of this article. Further, this entire step is subject to debate for those without the proper training so use great care in your process here. Do cover them to keep them warm with (unless there are signs of heat-related illness then cool, water, and shade are your friends). If they are very cold, clearly hypothermic, or frostbit. just try to keep them from getting colder. If only shivering and mildly hypothermic, give them food, give them layers, and get them moving. Do stay with the patient, monitor them, note how they look, take vitals if you can and record them if possible so as to detect any trends, try to keep them with you, talking, awake. Reassure them the best you can while you wait. Do look for identification if unresponsive and an illness is suspected. Make a quick search for a medical bracelet, necklace, or tattoo such as a diabetic might have (give them sugar under their bottom lip if they are). Same for an inhaler, Epi-Pen, or any known medications. Look for these things. Any of them may provide important clues. Do administer Benedryl if the patient is clearly having an allergic reaction. If it is clearly a heart attack, give them aspirin. Never give medicines unless you’re positive and only give those you can get over-the-counter. Do observe circulation, sensation, and movement. If they broke something like a lower leg, for example, can they wiggle their toes and feel your touch? Is there circulation or a white, bloodless foot? Rescuers will love to know this stuff, but don’t try to address a break unless you’re trained or given instructions. Do slow the flow. If there is a lot of bleeding applying pressure with a shirt or something will be super important as you will want to slow or stop the bleeding. This, too, is on the edge of what you’ll be able to do without proper training. Remember, also, to protect yourself from bodily fluids as noted above. Do try to prioritize, keep calm, and use your head. And do take care of yourself and encourage any others in your party that remain to do the same. Remember, one patient is better than two. How is everyone else doing? Is the scene still safe? Do your best. Even as the trained professionals we are, not being exposed to these scenarios regularly, we will get rusty, unpracticed, even unsure. That’s natural (or we hope it is so we don’t feel like we’re the only ones). If we forgot something important or obvious in this article, feel free to contact us so we may consider adding it. Do get trained. If you’re out there playing in the mountains or backcountry fairly regularly, you should seek some basic training. You never know when you might need it. Don’t approach the patient if the scene is not safe. Even if it’s a loved one, one patient is better than two. Not approaching could be incredibly difficult to do, but you need to find the restraint for safety reasons. Don’t panic. This does nothing for no one. If you can’t keep your head, don’t help. Nobody is expecting you to be chill or calm on the inside, but you must outwardly keep your composure and keep your mind focused. Don’t rush. There is an expression: “Slow is smooth, and smooth is fast.” Understand this and live it. Akin to panicking, rushing will do nothing for no one and every task will likely end up taking longer than it would if you worked calmly and methodically. Don’t say horrible things. As noted above, even an unresponsive patient may be able to hear you. Be a calm, smooth professional even if you aren’t. Be a friend. You’ve seen professionals on television… act like them. Don’t make knots if you tie on bandages to stop bleeding. Make a bow so it can be adjusted and the area can be checked later on. Know this: pros make bows. Seriously. Don’t step over the patient. This can lead to further injury and it’s just not the right thing to do. Walk around the patient. Don’t diagnose or make any declarations. Unless you’re a doctor, don’t try to diagnose the patient and pronounce anyone dead, even if you can’t get vitals. That said, if it’s obvious the patient has an angulated fracture of the arm, or you can’t get vitals, you should certainly make it clear to rescuers what you’re observing. Don’t get in the way once trained personnel arrive on scene. Stay close by and let them know you’re willing to help, and do convey any and all information you may have, but stand clear unless asked to do otherwise. If you find you really must do something, be crowd control making sure others don’t get in the way. There is not much more you can do unless you’re actually trained. Be a friend and follow the guidelines above. Be attentive, be aware, try to keep talking, and wait. And do remember to take care of yourself while doing this. Use the patient’s layers and gear on the patient so you can use your layers and gear for yourself.